When you choose Heil heating and cooling equipment, it means your home comfort is backed by superior engineering and quality manufacturing so you can enjoy more important things. Each unit is 100% run tested, and we design our products to give you the best in quality, energy efficiency and reliability. It’s our tradition to deliver products that exceed your expectations. The only No Hassle Replacement™ limited warranty that you’ll find in the industry backs every Heil Quiet Comfort® product. It means comfort with no questions. We’ll replace your unit if the compressor or coil fails within the covered period. We give you extra coverage in addition to a 10-year parts and compressor limited warranty. 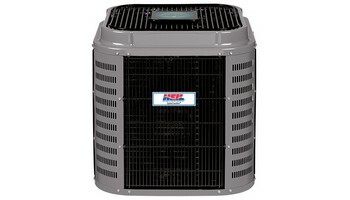 Heil split system air conditioners are designed for the best in durability and comfort. Properly matched combinations of an outdoor air conditioner and a separate indoor unit can be customized to provide cooling, gas heating, and/or electric heating. By combining the appropriate indoor unit with a matching outdoor unit, various combinations of cooling and heating methods can be created for the optimal combination of comfort, efficiency and economy. The Quiet Comfort air conditioner series offers our best comfort in the warm seasons, from the highest featured Observer communicating system to the budget-friendly with single- and two-stage scroll compressors, as well as efficient fan motors that deliver quiet comfort and humidity control. Get the most out of a split system by choosing the air conditioner that fits your comfort needs. All of our air conditioners include comfort enhancing and durable features to deliver lasting performance. For the maximum combination of comfort, efficiency and convenience, ask about our Observer communicating system models with Wi-Fi capability. For greater efficiency in a unit, look for two-stage compressor operation. Our toughest and quietest outdoor units feature wire hail guard grilles, corner posts, and compressor sound jackets. And our No Hassle Replacement limited warranty is offered on our premium products to give you peace of mind. Heil split system air conditioners offer energy efficiency, increased comfort, durable performance, and quiet operation.